There are so many terms popping up on food labels it can be hard to know how to make sense of it all - organic, biodynamic, heirloom, natural… What is worth the extra money? Sprouting refers to when the seed has just begun to grow, before it becomes a plant. When the sprout begins to germinate, the seed breaks down starch, which increases nutrient levels. This process also breaks down chemicals that can lessen bioavailability, which translates into how well your body absorbs the other nutrients present in the food. In grains, this means that your body will benefit from more vitamins such as folate, iron, vitamin C, zinc, magnesium, and protein. You’ll be getting more nutrients in less food. Since germination also lessens the amount of starch in the food, it can make sprouted grains easier to digest, which can be especially helpful for those who sometimes have issues digesting grains. 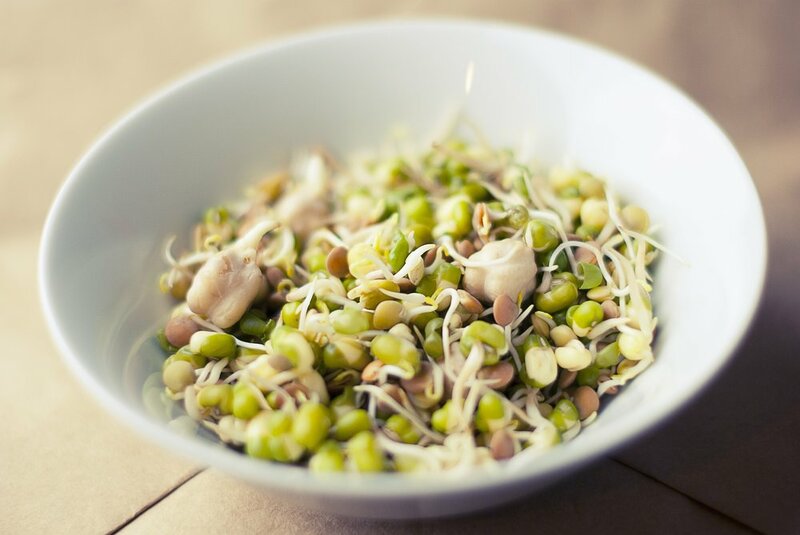 There are a couple of caveats to keep in mind with regards to sprouted foods. First, be mindful of bacteria. Sprouts can be contaminated by harmful bacteria such as E. coli. Buy your fresh sprouts from somewhere you trust. Also, be sure to enjoy your sprouted foods sooner rather than later--within two or three days. If you’re bringing them to work, be sure to put them in the office fridge when you get in--sprouts and sprouted products should generally be kept in the refrigerator. If you want to be super careful, use sprouts in cooked foods. Kristina Secinaro, a registered dietician at Beth Israel Deaconess Medical Center, suggests incorporating them into your baked goods, by grounding sprouts into a paste that you can add to your recipe. You can also cook the raw sprouts as part of a dish. The cooking process can kill that potentially harmful bacteria. Sprouting is something you can do in your own kitchen to save money and be in control of the process to make sure it is done safely. Try this recipe from The Kitchn for sprouted grains. If you’re interested in branching out from grains, you can use this guide to see how long it takes to sprout different legumes and grains. If you don’t want to DIY, Secarino suggests checking nutrition labels to find the healthiest sprouted products, since some have only a little bit of sprouted ingredients, but many preservatives. So, the next time you're getting groceries, keep an eye out for those sprouts!